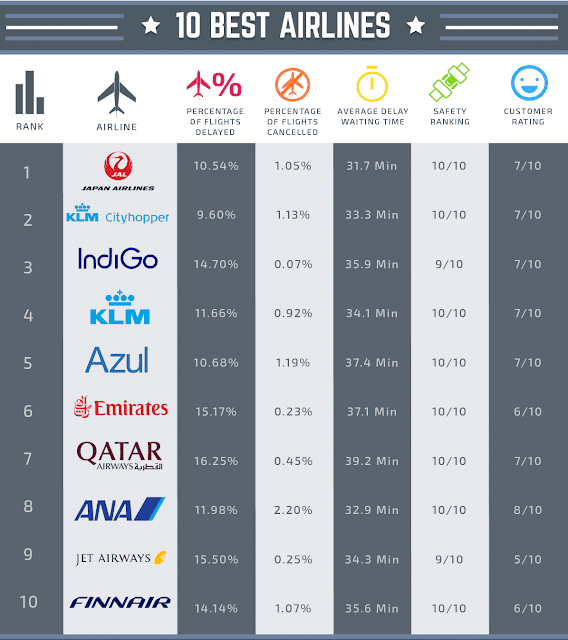 A just-released survey shows budget airlines are the best when it comes time to redeem accrued miles for an award seat but, overall, fewer seats are available when using accrued miles on the world’s airlines. 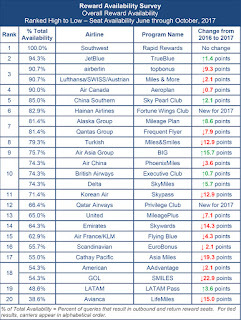 The eighth annual Reward Seat Availability Survey, sponsored by CarTrawler and conducted by The IdeaWorksCompany, shows that Southwest Airlines (NYSE:LUV) had the best award seat availability, with 100 percent of its flights having seats available for those who wanted to redeem Rapid Rewards points. JetBlue was second, at 94.3 percent of flights, which was up 1.4 points from the 2016 survey. The survey is based on 7,420 booking and fare queries made by the IdeaWorksCompany at the websites of 25 frequent flier programs during March 2017. Travel dates spanned June through October 2017, with top routes for each carrier checked to assess “saver style” reward seat availability. A minimum of two seats was required for each outbound and inbound reward booking query. Among U.S. airlines, Seattle-headquartered Alaska Air Group (NYSE:ALK) was third-best overall and the highest-rated among “traditional” carriers, with seats available on 81.4 percent of its flights. Alaska Air Group comprises Alaska Airlines, Virgin America and Horizon Airlines. Alaska was followed by Delta Air Lines (NYSE:DAL) at 74.3 percent, United Airlines (NYSE:UAL) at 65 percent, and American Airlines (NASDAQ:AAL) at 54.3 percent. Overall, the results of the 2017 survey ended a string of annual improvements that began in 2010. Since then, award seat availability had steadily increased to 2016, when 76.6 percent of reward queries provided access to a saver-style seats overall. That figure dropped to 72.4 percent in 2017. As in previous years, survey findings indicate frequent fliers are generally better served by the reward programs at value-oriented airlines, but availability varied widely by carrier. While five budget carriers surveyed averaged 83 percent availability compared to traditional carriers’ average of 69.8 percent, low-cost carriers ranged from high scores of 100 percent, 94.3 percent and 90.7 percent for Southwest, jetBlue and airberlin, respectively, to Air Asia at 75.7 percent and cellar-dweller GOL at 54.3 percent availability. Budget carriers' rankings as both the best and the worst in this survey mirror the results of a customer satisfaction survey released in April. 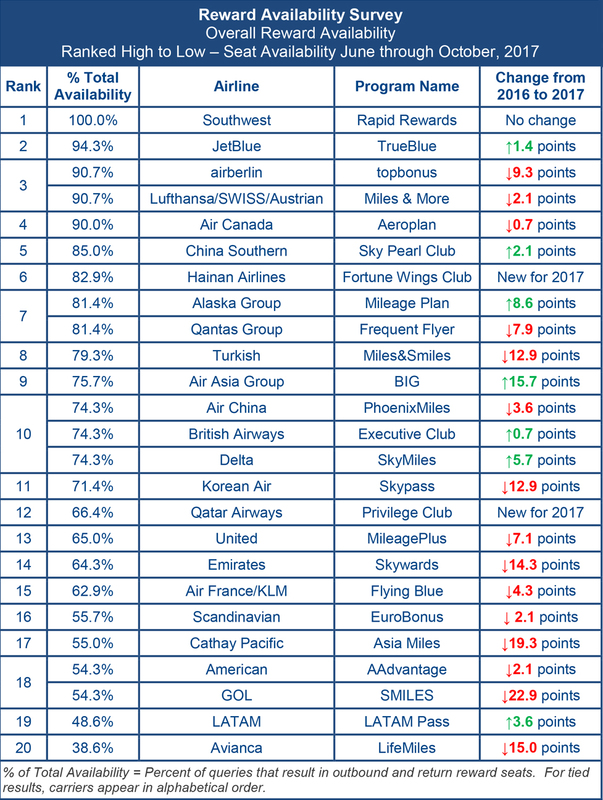 Of the 25 world airlines surveyed, 15 showed less reward seat availability than in the previous survey, while only seven showed improved availability. Southwest has consistently topped the list with seat availability on 100 percent of its flights every year since at least 2012, while Hainan Airways and Qatar Airways were new to the list in 2017. Reward seat availability dropped by more than five points for 2017 at nine of the carriers surveyed, and IdeaWorksCompany noted that it is no coincidence six of those airlines also face financial challenges for the current year. They include airberlin, Cathay Pacific, Emirates, and Turkish Airlines. In addition, long-haul availability also declined after years of steady improvement with only four airlines having availability scores above 70 percent for 2017, compared to eight last year. Harder to earn; harder to use? Delta moved from a mileage basis to a revenue basis for its SkyMiles program starting in 2015 and most other major airlines have since followed suit. Although the change makes it more difficult for many fliers to accrue the miles needed for a free flight, Delta is the only U.S. carrier that has shown consistent improvement in year-over-year availability. In 2012, Delta had only 27.1 percent reward seat availability. That improved to 36.4 percent in 2013, jumped to 55 percent in 2015, edged up to 57.9 percent in 2015 and rose to 68.6 percent in 2016 before reaching 74.3 percent in this year’s survey. By contrast, stalwart American has hovered within about six points of 50 percent availability since 2012, with the exception of its high-water mark of 67.1 percent in 2015. This year, it is at 54.3 percent. As Benjamin Disraeli said and Mark Twain often quoted, “There are three kinds of lies: Lies, damned lies, and statistics.” In this case, the statistics only hint at how difficult it actually is to use accrued AAdvantage miles. With several trips on the horizon, I have attempted to book flights using my accrued AAdvantage miles for trips ranging from cross-country domestic flights to trips farther afield. While American’s website did offer flight options, the flights were obviously the less desirable of those American operates because of their flight times – overnight, for example – or because they required stops, layovers and/or changes of planes to reach my proposed destinations. Accordingly, I would speculate that the planes flying those itineraries also have the largest number of empty seats, and empty seats don’t generate revenue, so why not give them away? On one hand, I understand the fiscal sense of giving away something that a company likely wouldn’t sell anyway as opposed to displacing a paying customer. 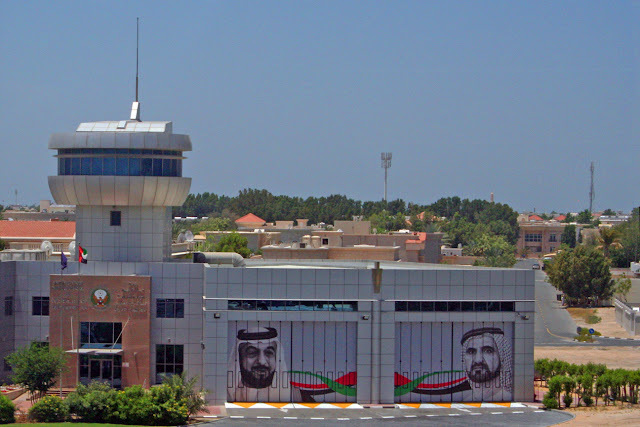 On the other hand, if a company wants to engender my loyalty and encourage me to continue doing business with it, it would make sense to offer me something of greater value than an overnight flight with a stop and lengthy layover between Seattle (SEA) and Miami (MIA), especially when the airline operates non-stop flights on the same route. So, while the AAdvantage program may have won the 2017 Freddie Award for “Best Elite Frequent Flier Program,” the non-elite members among us may be considerably less impressed. I know I am. Full disclosure: I am an active member of United’s MileagePlus program, American’s AAdvantage Program, and Alaska’s MileagePlan. 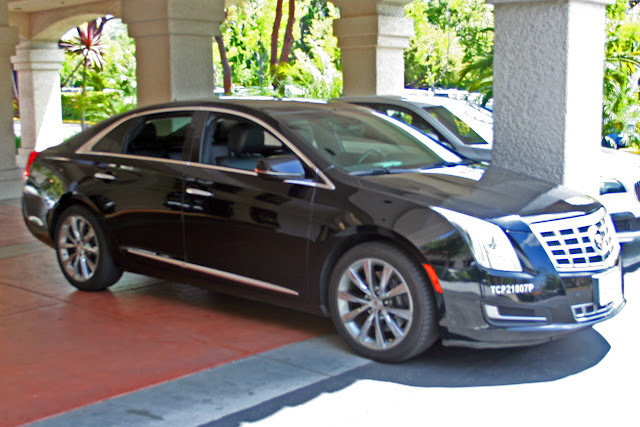 I am also an infrequent user of Southwest’s Rapid Rewards and Delta’s SkyMiles programs.